Now that the 2014 edition of the Working Wood in the Eighteenth Century Symposium is over and all of our attendees are (hopefully) back home safe, sound, and ready for another year of period furniture making, we thought we should probably get to work finishing up those pieces we demonstrated on stage. Before we do that though, we wanted to offer up a sincere expression of our gratitude to all who attended. It’s great to see so many familiar faces along with some new ones as well. A lot of work goes into preparing these conferences, but the period furniture makers family reunion atmosphere you all help create makes the effort more than worth our while. We thank you and hope to see you all again next year – that includes you too, readers who could not make it. We’ll let you know when we have a theme for next year worked out. Cabinetmaker Brian Weldy is just moments away from final assembly on the gate leg table. I mentioned to folks that the end of the Symposium effectively marks the beginning of the new year for us in the Hay shop. Here’s our collective resolution: to be more active bloggers. 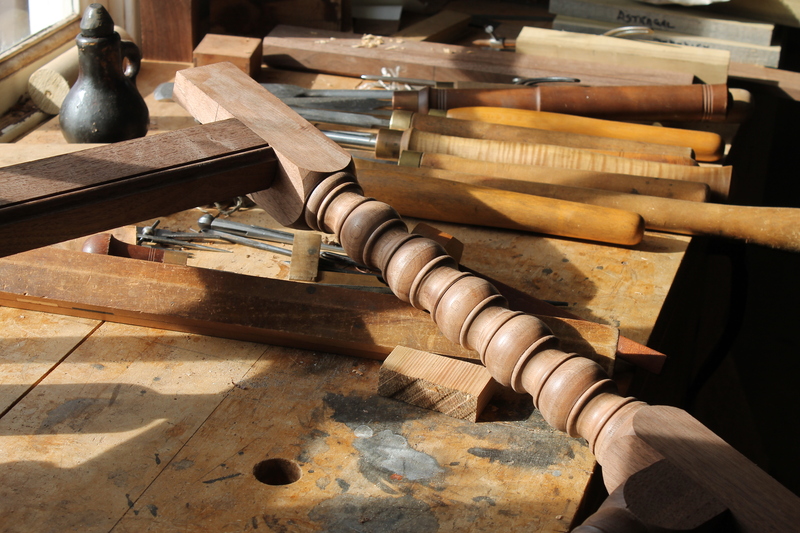 That means we’ll keep you up to date on our progress with the early gate leg table, the Buckland and Sears sideboard, all the other shop projects underway, and any random musings about eighteenth century cabinetmaking we might have. 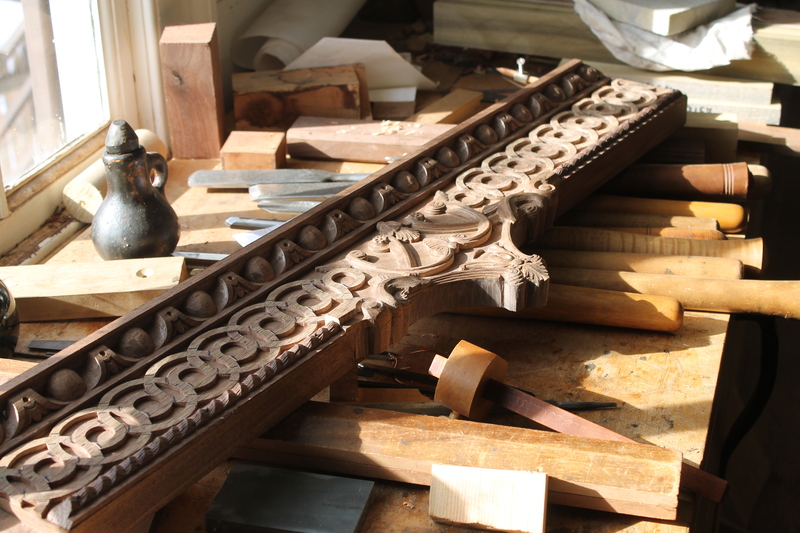 Bill Pavlak and Kaare Loftheim are progressing with work on the Buckland and Sears Sideboard. Here’s where we are on the front rail There is still a lot to do! The Symposium also gave us the opportunity to work closely with MESDA and its gracious staff, especially Robert Leath and Daniel Ackermann. We were also pleased to have Steve Latta back at the conference this year, as any opportunity to watch him present and teach is always welcome indeed. Steve’s willingness to expand his presentations to accommodate a last minute schedule change was more than kind and we’re so grateful. Our own Colonial Williamsburg joiner Ted Boscana also deserves a mountain of thanks for expanding his program at the last moment. Finally, my drawings for details of the Buckland and Sears sideboard table came out quite poorly in the Symposium handout. I apologize for that and have included them here for everyone. 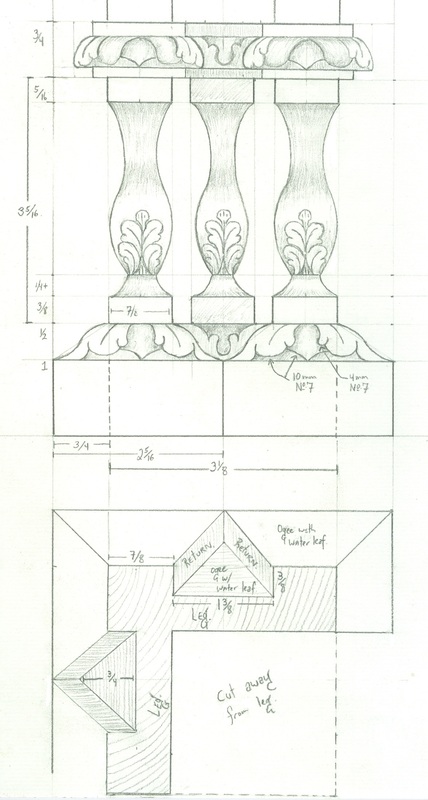 I would also like to direct you to Tim Killen’s SketchUp blog for Fine Woodworking where he has included a digital version of the egg and dart molding. Tim has been a steadfast supporter of the Symposium through his blog for the past several years and we’re quite grateful for that. 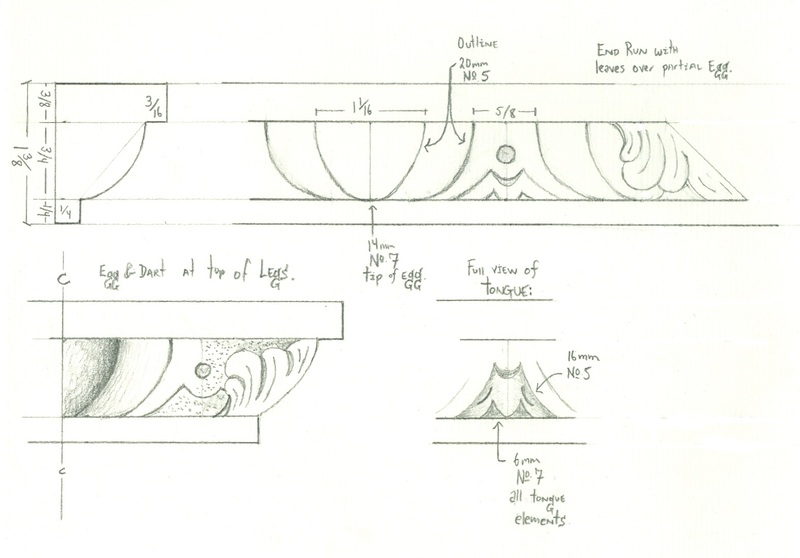 Foot Design for Buckland and Sears Sideboard Table. This entry was posted in Shop Happenings, Symposium, Tables. Bookmark the permalink. Thanks to everyone for another great symposium! The entire crew at CW, along with the guest presenters, do a great job every year. And thanks to Bill for the drawings – they are so much better than the handout pages. Any chance you could complete the set by adding the Sideboard rosette? That drawing is also quite faint. I look forward to the increase in postings and next year’s conference. And congratulations to Kaare for being made supervisor of the Hay Shop. Thank you for reminding me. We haven’t posted a video on the site before so it might take us a bit to work out the details. I’ll make sure it’s up by the middle of February. It was indeed an exciting and informative week for me; it was my first Symposium! I can’t thank all of the CW Staff enough for the friendliness and helpful tips, I felt right at home. I joined SAPFM last fall and was grateful to the members of the Executive Committee for their warm greetings. My Yarborough side of my family are 18th Century natives of Davidson County, NC and knowing that the Swisegood Corner Cupboard from MESDA was going to be presented was the highlight for me. After studying the construction from a distance, I became curious on my trip back to NC regarding the assembly of the corner cupboard. I failed to ask that question at the event; what came first? I have drawn a plan for one, and it seems to me that the shelves are cut first and the back added to sure it up, and then the front frame, with the doors last. Forgive me if this seems elementary, but I have never built a corner cupboard; and hoping to short cut my discovery with your input! Thanks again so much for a great event! Dave, thanks for pointing that out! I am eating my words so much that I’m putting on weight and killing two resolution at once. In all honesty we’re not happy about it, but have a several posts that are just about ready to go. We’ve had a busy winter and will be posting soon. Sorry, somedays the devil gets in me. 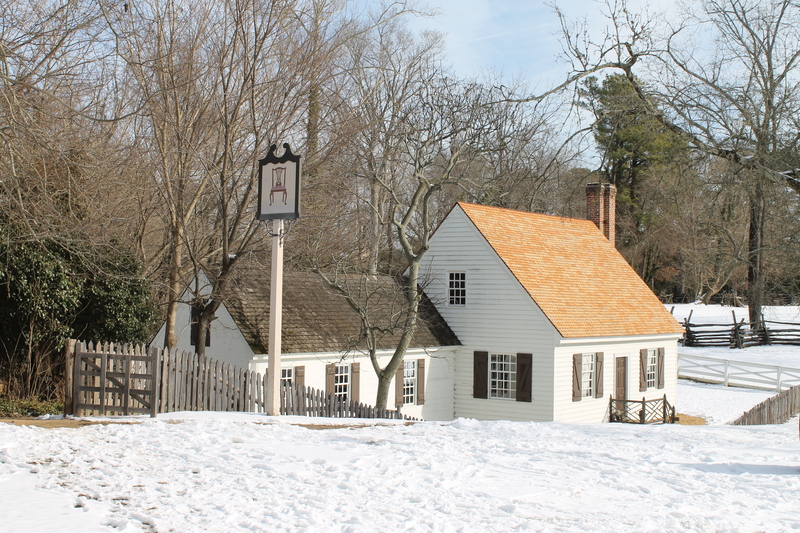 We really have loved all our visits to Williamsburg and the Hay shop is our frst stop. Reading your blog reminds me of the visits so I get antsy waiting for the next entry. Also there’s always good info to be had from your blog.